Address: 9912 S. Sandy Ct.
"A Tranquil Treat" is a lovely ocean side vacation home that offers bright and beachy decor, short walk to the beach and upgrades in 2018 that included new exterior paint and wood-look flooring in the main living area. 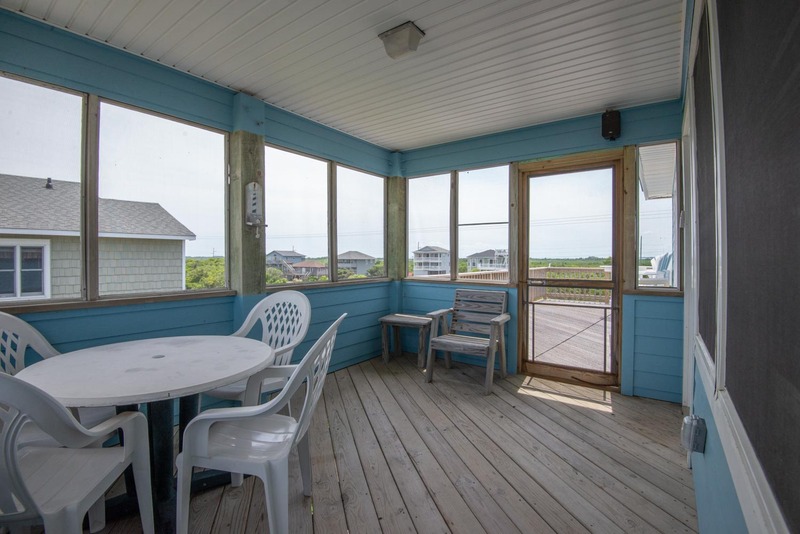 There are ample, well-furnished decks and a screened porch that are ideal for taking in the cool summer breeze and the location offers quiet and relaxing setting. 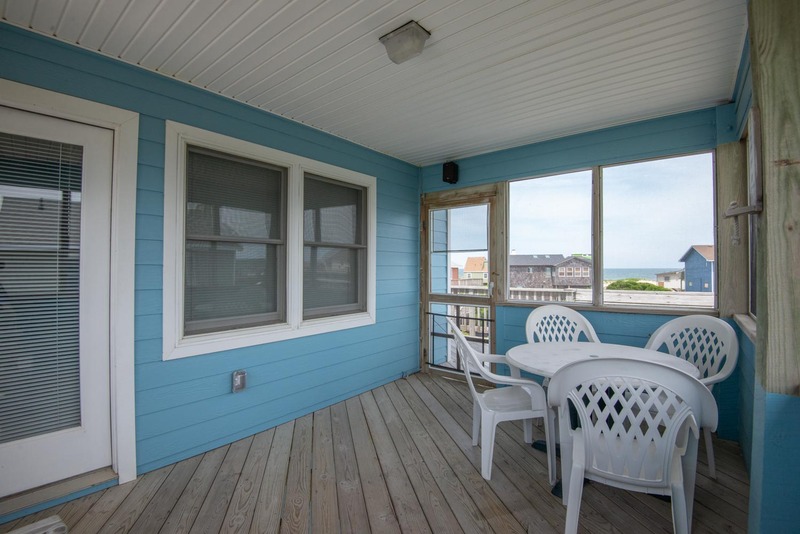 This lovely vacation home is located in peaceful South Nags Head & offers Views of the Bodie Island Lighthouse, Roanoke Sound, & the Ocean from the top floor. 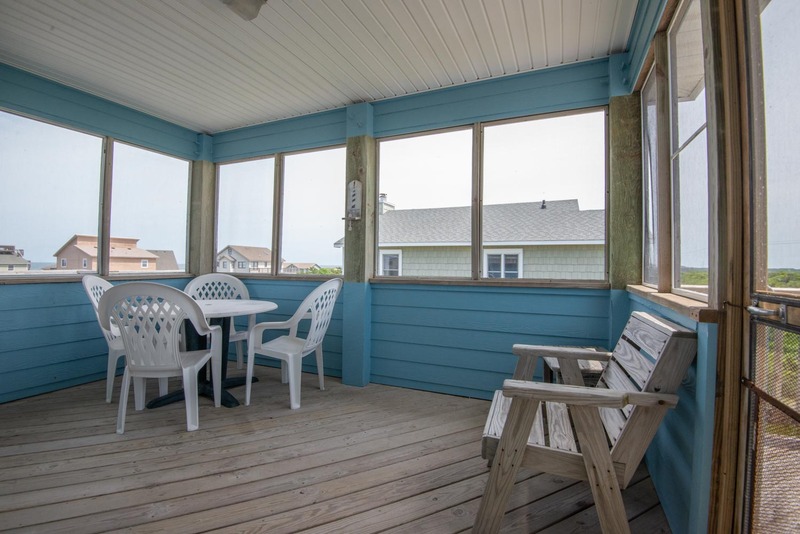 Very well equipped, multiple decks & a screened porch make this "pet friendly" vacation retreat a excellent choice for your trip to the Outer Banks. A short stroll to the Beach, this nicely decorated & comfortably furnished home is a Lighthouse Lover's Dream. Convenient to Oregon Inlet, Pea Island National Wildlife Refuge, Outer Banks Fishing Pier & shopping & dining are only a few minutes drive away. Ground Level: Parking for 3+ Cars, Covered Entry, Laundry Area, Enclosed Outside Shower, Fish Cleaning Table, & Charcoal Grill. Mid Level: 3 Bedrooms (Master Suite w/Queen & Full Bath, 1 w/2 Singles, 1 w/ Duo Bunk w/Trundle), Full Bath, & 2 Covered Decks. Top Floor: Spacious Living/Dining Kitchen Area, TV Entertainment System w/DVD, Game Table, Bedroom w/Queen, Full Bath, Screened Porch, & new large Sun Deck, perfect for taking in the exceptional sunsets. Features include: C/AC & Heat, Washer/Dryer, Dishwasher, Microwave, 5 Flat Screen TVs, Stereo w/CD, Wireless Internet, Baby Equipment (Port-a-Crib & High Chair), & 4 Ceiling Fans. One Mature Dog Allowed w/Fee. This is a Non-Smoking Unit. The Town of Nags Head is getting MORE BEACH TO LOVE. 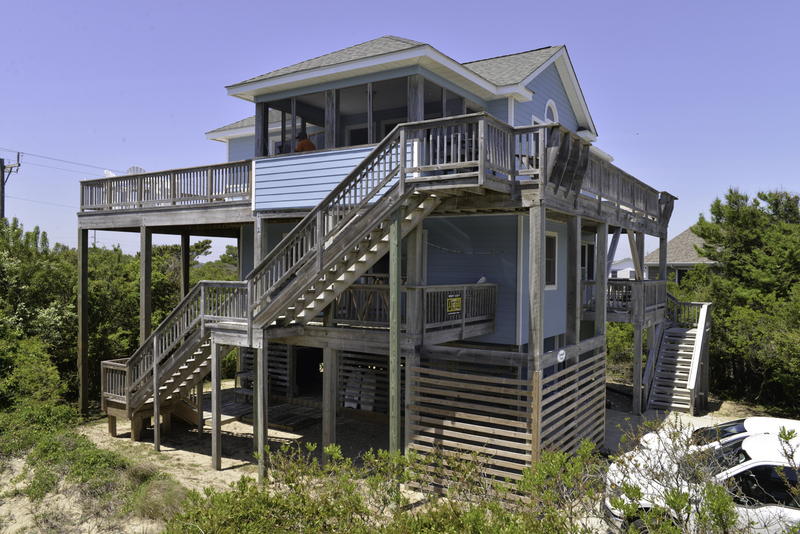 This home is in an area that may be affected by the Nags Head re-nourishment project. Please visit the Dare County website morebeachtolove.com for current updates & information provided directly from the County. We enjoy the home and location. And it well equipped. Love coming back to this home each year and appreciate how well-maintained the owners keep it! We love this home. It is very comfortable for our family and nice proximity to the beach. We love the views and the sunset deck that was added two years ago. House was very well equipped for a family vacation. We appreciated all the little things that made it feel like home away from home. We've stayed at this property for many years now. We're very happy that the new owners have maintained it so well and have in fact improved upon it, esp. by expanding the deck. It always feels like a second home to us! We love your home and the improvements you made to the sunset deck. Our family truly enjoys the space and how comfortable all the rooms are. We just couldn't believe the the condition of your house and the cool features. Our stay was so comfortable because of that. We used to stay at a house down the road but A Tranquil Treat is numero uno on our list now. This was our third stay in Tranquil Treat, and we had a wonderful time. The new appliances were great. House was clean and beautiful! The new sunset deck was a wonderful addition to the home. This was the best equipped house that we have rented. The owners thought of everything! The house is very comfortable and clean. Well equipped kitchen! Great views of ocean. Loved the screened in porch during rain and in the evening. Easy walk to beach. Thanks for letting us use the wagon and boogie boards. Cul de sac great for kids to play. Great family cottage! Loved the new deck on the back! Beautiful home! Very close to the beach. You will not be disappointed if you rent this rental property!! I love this cottage and the way the new owners have maintained it. Will keep coming back as long as it's available!! Thanks! This home is beautiful inside and out, in a perfect location at the end of a culdesac with a short walk to the beach. Excellent ocean views from the top deck with lots of chairs, well equipped kitchen, and tv's in every room was a NICE bonus! Perfect beach vacation home! This was our second stay in A Tranquil Treat, and it was as enjoyable as the first. The home really shows \pride of ownership\" and is well-maintained. It's very well-equipped and comfortable and was the perfect place to relax and enjoy the Outer Banks. We definitely plan to stay there again. Thanks!" Beautiful. All you need is there.